In the past I’ve been very dismissive of Altcoins, and endorsed the philosophy of “Bitcoin Maximalism” (that Bitcoin is all you need). Network Effects – In the past, Bitcoin had 90+% of the crypto market, and the remaining 10% was distributed among many terrible projects. Thus, Bitcoin’s network effect effectively shielded it from competition. Utility – With a few important exceptions, no Altcoin offered anything new to the user. Instead, the alternative explanation (that the Altcoin-creators were just taking people’s money) was overwhelmingly accurate. Sidechains – I assumed sidechains would be eventually invented. At which point, they’d absorb features of rival blockchains. The first reason, in particular, has not held up well over time. The market share (among investors) of “Bitcoin Core” (the healthiest candidate) has fallen to 45% or so. Many people, myself included, believe that this downturn is only temporary. But as new data rolls in, it is time to take seriously the alternative theory: that the “network effect shield” has departed – or at least significantly weakened. These data are: that it has now been over two years since Bitcoin was last above 90%; it has been 12 months since it was above 80%; it has been under 50% for 7 of the last 12 months, including the most recent three months; during which it reached its all-time low (of 32%, under a third). Most perplexing is the relentless, stable, multi-year progress of the “Others” category. This is a direct challenge to the logic of network effects. Furthermore, many of Bitcoin strongest defenders have jumped ship, and a few of these are even socially secure enough to admit so openly. Roger Ver, indefatigable promoter and angel investor, owner of the Bitcoin.com domain, now favors Bitcoin Cash. Brian Armstrong, CEO of the $1B Unicorn company Coinbase (which occasionally has the most-downloaded smartphone app), now favors Ethereum. Reasons 2 and 3 have not done as well as I’ve hoped, either. The Altcoins of today do offer their users a real value proposition – two in fact. At minimum, Altcoins offer users “cheap blockspace”. User wants to buy something, for (say) $20. User then spends $20 on “crypto”, and immediately spends that crypto on their desired end-product. The merchant receives the crypto and immediately sells it for $20. For such txns, cheap blockspace is ideal. Furthermore, services (ShapeShift, Poloniex, et al) have evolved to make these markets user-friendly and liquid. It is now easier than ever to accept currency from “exotic blockchains” for payment. These days, if you can accept one crypto, you can accept them all. Today’s Altcoins do more than just offer cheap payments. They also offer permissionless innovation. Certain ideas, such as Monero, Siacoin, Namecoin, and Zcash, cannot efficiently be tested in any other way. Many ideas that I originally felt were laughable, such as Dash’s “marketing budget”, have nonetheless proven to be effective1. Of course, these experiments should have been done on sidechains (which we will turn to in a moment). As to the first value proposition (cheap payments), much has already been said. I have written an article with my nuanced views on the subject. More important is to discuss the second value proposition. For, while the Altcoins try 1001 new ideas a day, (most bad, but occasionally one or two good2), Bitcoin instead has retreated into an overcautious and highly-pretentious paternalism. I can count on three hands, the number of times I have been personally given the “we need to make sure the airplane doesn’t crash” metaphor, by extremely-senior members of our industry. Somehow, these people are oblivious to the fact that  they don’t own the plane in question,  it is being flown via remote control, from the ground, and  the plane’s owner can freely make a near-infinite number of copies. It is not so much a passenger-laden plane, but a flight simulator virtual-reality videogame. The Altcoin ideas are judged, appropriately, by the user. Bitcoin, in contrast, is now tending to choose its ideas based on how impressive they are to other members of a pseudo-academic pseudo-bureaucracy. The emphasis is not on scientific progress, it is instead (I am sorry to say) on racketeering – in other words, on generating a need for “experts” (ie, paid consultants), and building a justification for an endless series of prestigious “conferences” (ie all-expense-paid “parties” in exotic locations). Let me be more constructive with my criticism. A scientific environment requires certain features, including: a tolerance for dissent, an appreciation for discussion, a rejection of arguments-from-authority, and an optimistic outlook (one that we can make “win win” improvements to situations through better ideas, rational debate, and criticism). Above all, a scientific environment requires Karl Popper’s demarcation for science: that in addition to looking for confirming evidence of theories, we must try to falsify (ie, break) our favorite theories. Altcoins represent one method of falsification – trying the idea and watching to see if it fails. Sidechains are an even better method. “Peer Review” is only science if the peers are helping the author meet some objective external criterion (ie, one that exists independently of the peers and their opinions). Otherwise, peer review becomes a self-referential popularity contest. The point, since so pervasively and consistently misunderstood, bears repeating: Peer review is supposed to be a cheaper realistic “simulation” of reality. It is not a popularity contest! Unfortunately, for the significant questions3, the atmosphere of science is departing from Modern Bitcoin. One smoking gun is the reaction of both LargeBlockers and SmallBlockers to the idea of fork futures. Futures prices, (unlike “tweets” or “conference presentations), have the unique ability to speak for everyone, and not just their author. For that very reason, they have the unique ability to singlehandedly predict the fate of any fork4. Despite this, there was no interest in creating such markets. When they were created anyway, the losing side refused to acknowledge them as legitimate. When I proposed a way of making them more legitimate, the losing side was not interested! This disinterest parallels the shameful behavior concerning the “bitcoinocracy” numbers – the evidence changed for, and then against, the SmallBlockers, and so they shifted from rejecting, to endorsing, and finally to rejecting the legitimacy5 of this empirical evidence. This is a root and branch rejection of the value of experimental testing. Very shameful. It acts to establish a “technocracy” of ruling bureaucrats (again: accountable to each other, and not to the customer). It exploits the power in the remaining network effects, and uses it to enable a monopoly – in other words, uses it to ensure that dissatisfied customers have no recourse. As the scientific atmosphere declines (and, please, do not confuse science with engineering), standards of discourse have declined as well. Today, it is impossible to express any view on “scaling” without it being immediately pigeonholed into a “Republican” (SmallBlocker) or “Democratic” (LargeBlocker) category. We even have our own RNC and DNC, and our own party leaders and campaign managers. Any project or solution which attempts to be “non-partisan” might as well be a third party candidate seeking election. One can even be “found guilty” of listening to the wrong Bitcoin show or attending the wrong conference. But a real scientist, embracing falsifiability, would be sure to attend conferences given by people he or she doesn’t agree with. Instead we have two different flavors of a dystopian One Party State – authoritarianism on the right, and on the left a kind of “intellectual communism” where everyone gets a trophy for their ideas, no matter how dumb these ideas are (especially the low standards of Classic / Unlimited leading to assert(0) bugs etc etc). Clever Altcoiners have noticed these deficiencies (and the insecurities they inspire) and exploited them. Buterin, for example, is careful to back the minority side in the BTC BCH conflict; and Dash started up a meme about their “governance” solution (whatever that was) to profit off of dissatisfaction with Bitcoin governance. One can dismiss these maneuvers are mere campaigning, but they are only possible because of real flaws that actually exist in the Bitcoin community. Finally, what of the hope that sidechains tech will obliterate the Altcoins? No one alive is in a better position to answer than I. After Blockstream gave up on sidechains in 20156, I wrote my own idea in November of that year. It remains, to this day, the only concrete proposal for P2P sidechains, let alone the only implementation. I’ve presented on sidechain theory and risks, and at Scalings II and III (the II presentation was a small “WIP” and these were not recorded, I believe). My view is that the scaling conflict is important, and that sidechains are the best way to resolve it. In fact, my current view is that sidechains are the only way to resolve the conflict. This is because the disagreement is actually about “node costs”, and not about transaction throughput. Blockchain technology is inherently “consensus”-based. But since each person is different, there is a limit to how large a community can grow before there is infighting. Sidechains resolve these issues. Despite this, interest in Drivechain has consistently been low, among Democrats and Republicans alike. Democrats (supposedly) control >50% of the hashpower, and could unilaterally gain a blocksize increase by adding sidechains. But they are not interested. MimbleWimble, originating deep in Republican territory (#bitcoin-wizards), now plans to launch as an Altcoin. What explains this profound apathy for sidechains? I will first give some prudent reasons (ie “happy” reasons), and then what I believe to be the “real” reasons. Here are some simple and, at first glance, believable reasons for sidechain apathy. Perhaps sidechains are just a bad idea? And, since there’s no point wasting time talking about a useless feature, people rightly don’t talk about it. I think that the causality here is reversed: people become disinterested first, and this disinterest drives them to make lazy, error-prone comments. First, I can’t find any evidence that sidechains are a bad idea – I give a lengthy defense of drivechain (currently the only sidechains proposal) in this video and in my FAQ. Instead, there is profound evidence of bad claims that sidechains are a bad idea – most critics admit that they made no effort to understand the idea before criticizing it7. However, more fundamentally, even if drivechain were bad, it is a soft fork. So, it can be freely and completely ignored by disinterested users. And it actually cannot be prevented if miners decide to use their hashrate to unilaterally activate it. So I don’t see how talking about it could be a waste of time. If bad, it should be talked about, because it is unpreventable. Criticisms shouldn’t be of it, they should only be of the opt-in-ers. So a better explaination is that the “bad idea –> therefore disinterested” causality must be reversed, I think. The trust is “disinterest –> therefore ignorant comments”. Perhaps sidechains are inherently boring. But this does not square with the attention they get from Bitcoin Media, and their disruptiveness to the competitive landscape and to people’s investments. Perhaps people are just too busy with everything that is going on. But this explanation would apply equally well to every new idea. And drivechain is a very old idea, it is much older than SegWit and the spec was published in Nov 2015. And there is no “moral” or “religious” objection to talking about sidechains, either. I can get principled developers to review the code, if I pay them. Disinterested third parties have also offered to pay for drivechain code review, with some success. So the potential for interest in sidechains is there, but the inherent interest is just disproportionately low. So, then, why is that? Here I present what I feel are the “real” reasons. Crypto-commentators care a lot about their reputation8, as it can lead to lucrative job offers (in every sense – paid well and no work required), access to capital, invitations to luxurious conferences, and personal fame/prestige. Moreover, BTC-professionals take pride in their work (as they absolutely should). And thus, no one wants to be on the hook for a “BTC disaster”. And sidechains, along with their benefits, do present a scary new risk. Unlike the “code risks” in, for example, P2SH or CLTV, these risks can not be systematically hunted down and eliminated. So, commentators may see themselves as in a similar situation to the FDA [in the US], or an academic IRB: they will be disproportionately blamed if something goes wrong, but will not disproportionately benefit if everything goes well. These risks are freedom-enabling, and entirely opt-in. But who knows if the YouTube Audience / VC Investors / Program Committee / etc will see it that way? Instead it pays to “care” about the user’s funds, especially very loudly and at no cost to oneself. For existing Bitcoin Core developers specifically, the above position might be taken even further. Instead of the example of the FDA commenting on a drug, we might instead give an example where some of the world’s most prestigious doctors are asked to comment on a “magic infinite health pill” that was invented by a non-doctor. It is a clear conflict of interest – if society adopts the pill, the doctors will be out of a job. But we wouldn’t expect these sophisticated doctors to object so directly! Instead, we would expect them to resort to various pretexts – they would say “Well, we had better make sure that this pill is absolutely safe before we tell everyone to take it”. Even though by the time that absolute safety is established, many people will have likely died needless deaths. Hence it really is true that the scaling debate is “about control”. Since sidechains take control away from current elite Core developers, we would expect them to oppose sidechains. Human disputes, of all kinds, will reliably collapse onto a single dimension. This is why, in America, those who are “pro-choice” also tend to be “pro-Union”, despite those positions being objectively unrelated. This is simple math: a large unified group has the muscle to sequentially crush a set of smaller uncoordinated groups. Those who are audacious enough to vote third party have a vague awareness of this, and usually know that they are “throwing their vote away” and hurting their own causes. If you join one of the two major groups, your influence will be very small. But if you join neither it is likely to be zero. A LargeBlock sidechain is a competitor to both the LN (favored by Republicans) and a hardfork blocksize increase (favored by Democrats). Each party campaigns on a platform where they are the wisest (or, more accurately, they “have” the wisest) and they know what’s best. Thus, to support a largeblock sidechain would be to oppose the party leadership. But as I’ve just explained, this leads to one being rejected by one’s own party, and being unable even to join the rival party. So commentators (wisely) downplay their interest in a sidechains solution. Today, nearly every person, and every media outlet, has allowed themselves to be captured exclusively by one party. This one is very simple. The free rider problem is a one of immense practical importance. For Altcoins, of course, there is no free rider problem, because there are alt-owners who profit (disproportionately to everyone else) from the success of the Altcoin. But with sidechains, we have a situation where someone must do the work, at some cost to themselves, and yet the benefits are diffused across all Bitcoin owners. But this problem is common to all Bitcoin R&D, so I don’t see why it should apply especially to sidechains. Incentives in Bitcoin are not always perfectly aligned. Below I present some Bitcoin ideas/events/projects, and sort these into the groups that support them: Miners, Users, and [Republican] Developers. I could have included more groups, especially “Industry”, “Democratic Developers”, and “Cults of Personality”, but of course a two-dimensional figure simply cannot capture all of that. My point is that incentives do not always align. For better or for worse, the dumb people of the world form an intransigent minority, because they literally cannot appreciate good ideas. This is one reason why we are stuck with the QWERTY keyboard, for example (even those who type in Dvorak are doing so on a QWERTY keyboard layout). English is the international language, despite being awkward and hard to learn – Esperanto, in contrast, is very easy to learn but is spoken by no one. If you disqualify Esperanto, then consider French: it is easy to learn (compared to English), and was once the international language of diplomacy, once learned internationally by the upper classes and backed by a powerful nation. Yet today they all speak English in Quebec. 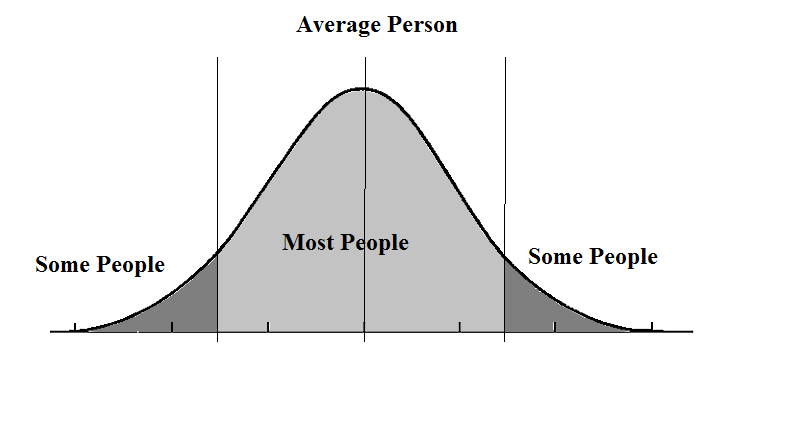 The fact of the matter is that anything with network effects is going to ultimately be ruled by the middle of the bell curve: the average people. In these analyses, timing is important: every project starts with zero users, so networks effects are small (and meritocratic effects dominate). But as time goes on, the project will attract more users, and so the network effects will become more important. Eventually, the network effects outweigh the meritocratic effects. Now, I’m just guessing here, but I think we have reached the post-expert phase. Anyone who can compare the 2018 TNABC to even the TNABC a year earlier will discover that the knowledgeable folks are vastly outnumbered. (And by “knowledgeable”, I mean “knows what a private key is”.) And, if the playing field is too ambiguous, these un-knowledgeables are going to glue the future to whatever shiny object can attract their attention first10. Secondly, the marginal meritocratic effects do not seem to be that significant. By this, I mean that the “Bitcoin vs Altcoin” differences are very tiny compared to the “Bitcoin vs Traditional Money” differences. Someone who needs financial sovereignty must abandon modern fiat currencies, but whether they transact in BTC or LTC or ETH will make no difference to them, and investors will need to invest in whichever money is the most recognizable. The differences in node cost, or in privacy, are not as relevant (most lay users care about neither)11. In a video discussion that accompanies today’s articles, Daniel Krawisz advised me to deploy Drivechains on both BTC and BCH (by hard forking one or both if necessary). But he did not advise me to also add drivechain to Bitcoin Gold or Diamond etc. It struck me as good advice – “Post-Maximalism” doesn’t need to mean “Altcoin Pluralism” – instead it can just mean “two competing Bitcoins”. So we don’t need to go from 1 to infinity, we can stop at 2. And perhaps we only stop at 2 for a short time, before returning back to 1 (for example if sidechains do, in fact, eliminate Altcoins). The emphasis on two competing projects reminded me of Karl Popper’s argument in favor of a two-party state. He argues that a system can become healthy, as long as the losing team becomes desperate upon their loss, and willing to take risks and make changes. Pretty good advice! Sergio Demian Lerner correctly points out that he did write a drivechain BIP+code in 2016. It had pros and cons relative to mine, some of which the two of us discussed together at Scaling Milan in late 2016 (he definitely helped improve our work). He also finishes my unfinished 7th point, by reminding us that Altcoins/ICOs can draw away sidechain talent. But this does not happen as easily for SegWit or P2SH. It also occured to me that working on sidechains is probably perceived as disloyal to Bitcoin. After all, what you’re really saying is that you want the freedom to leave this party, and go start your own party somewhere else. That’s bound to insult the current party-hosts, to some extent. So we can understand why they wouldn’t put sidechains on top of their list (although it is certainly a little presumptuous/creepy that they do not).